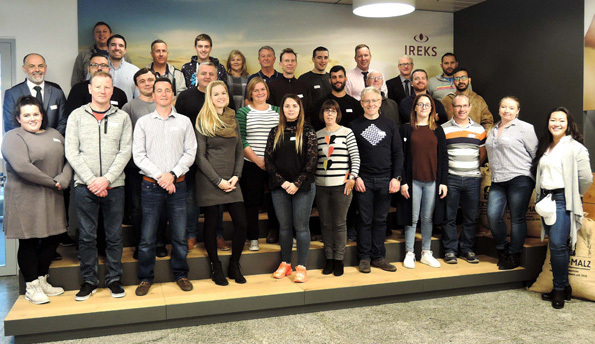 On Monday, 29th October, all the guests were welcomed to our premises and shown the IREKS company film. from the examination of raw materials in the state-of-the-art laboratory to the fully automatic packaging installation – every stage of production of our mixes was looked at closely. Of course, our malt installation and the Logistics Centre were also included! During the presentation of baked goods, the guests were familiarized with the advantages and possibilities of our mixes for confectionery baked goods and bread. They all had the chance to taste the products and form their own opinions. The recipes were available afterwards on USB flash drives, so they could be baked straight away in the bakeries of the visitors! Kulmbach is known for IREKS being a manufacturer of unique baking ingredients, but the lovely Old Town and the long history of the town are also remarkable. For this reason, a night watchman led us through the historical Old Town in the evening, ending up in a micro-brewery with an adjoining restaurant called the "Kommunbräu". The next day, we visited a bakery typical for the region. Many thanks go to the Kreuzer family for the interesting tour of the bakery and the fantastic breakfast enjoyed in a pleasant atmosphere! We then spent the afternoon in Bamberg. Here, several world cultural heritage sites from UNESCO can be found! Our final evening took place within the old walls of Zwernitz Castle. This greeting is also sent to the unparalleled accordion player who joined us on that evening: Ralf, you are just great!